Surrey GU Gardening & Tree Surgery | Quality Property Care Ltd.
You enjoy your garden but get less and lesser time for all the gardening and care it requirements? Have no worries, Quality Property Care Ltd. provides a professional gardening service at an affordable gardening price in Surrey GU and the region. The company gives both expert home and commercial gardening services of all kinds, and can take care of all your gardening demands, so that your outside vicinity results in being and stays absolutely gorgeous. Our gardening company delivers: tree surgery, gardening maintenance, garden design, garden clearance, lawn care and a maximum array of care for your backyard or different outdoor space. Call or contact on the web our client care service to make a request about the gardening services and get an close evaluation regarding the price of the gardening service you will need. We’ve been close with all of our Surrey GU clients, learning about the local plant life and how to best form your garden in accordance to your personal vision. Together with us, you may get an expert staff of gardeners who will arrive and examine the location, assess what needs to be carried out, or evaluate how long will it take to have the work done. We arrive wholly prepared, however, if you require a more specific work done, you need to inform us so we could bring the appropriate gear and personnel. Once on sight our gardeners go into a side door to avoid spreading dirt close to your property, even though not all properties allow for such an access. If it’s necessary they get coveralls and boot protectors to reduce the dirt transference into your home. Quality Property Care Ltd. top graded gardening company in Surrey GU sticks to the motto of personal approach + special attention to specifics as the best formula for success. 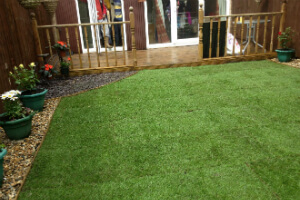 Except standard lawn care, leaves cutting & clearance, the skilful gardeners additionally pay attention at speedy weeding, ivy removal, grass cutting for a more eye-catching look of the garden, strick back and schrub, as well as careful jet washing, edging, rotavating and levelling. As an end result of such a sophisticated approach for reasonable and top-to-bottom garden maintenance, you will have an outdoor to admire with no efforts! Plus - our gardening services are inexpensive and low-cost! And you can obtain the service at a regular basis or just once in a while. So, why not reserve the gardening services offered by Quality Property Care Ltd. right away, and start that garden development you have been pondering about for quite a some time. Call Quality Property Care Ltd. Gardeners and Get Good Prices! Do what you have to do for your garden and get it back well managed and as it is an image of your beloved exterior design journal. Contact us on 020 3746 4287 and order pro gardening services in Surrey GU right away!